John Kander, Fred Ebb, and Richard Seff at a dinner honoring Harold Prince. Photo courtesy of Richard Seff. Quote from the song “Cabaret.” Photo courtesy of izquotes.com. One of the properties for which I tried to get this new team hired was the Theatre Guild’s upcoming The Unsinkable Molly Brown which had Richard Morris as book writer. The Guild wanted a name composer, but Kander and Ebb wrote some songs on spec from the script they were given. Morris was an acquaintance of Fred Ebb and he was hoping the Guild would hire them, but along came Meredith Willson, and his previous score for The Music Man put him on the A list, so Kander and Ebb were out. Morris later came back to them with an original script of his called Golden Gate, and they wrote a complete score for it. Ultimately, there were no takers, and it remains an unproduced show to remind all future aspirants that each time you’re at bat, you have to hit the ball, preferably out of the park, or you’re back to the bench till the next time you’re at bat. And that was true for Richard Rodgers, Alan Lerner, Oscar Hammerstein, Burton Lane, Jule Styne, Moss Hart, George Abbott, Stephen Sondhem, Adams and Strouse, Bock and Harnick, Jerry Herman down the line, and in this case to Kander and Ebb. Sticking to the game helps, and here’s how. Bob Dishy and Liza Minnelli in Flora, the Red Menace. This new team had auditioned for Hal Prince with scattered special material, all of it conceived for the stage rather than the pop world. But Prince, emerging from his role as bright young stage manager to very astute producer with close ties to master director George Abbott, was now about to produce Flora, the Red Menace under Mr. Abbott’s direction. It looked like a plum assignment, for Prince and Abbott were known for taking chances with promising new talents. They’d done well with neophyte composers Richard Adler and Jerry Ross on The Pajama Game and Bob Merrill on New Girl in Town. Mr. Abbott, who was so much older than most directors, had always liked working with bright new writers and had done so for years. 1941 comes to mind, with Hugh Martin and Ralph Blane’s first show Best Foot Forward, and a little later Betty Comden and Adolph Green’s debut with Leonard Bernstein thrown in for good measure for On The Town in 1944. Because Prince had enjoyed working with John Kander when he took on his first Broadway directing assignment as replacement on A Family Affair, he wanted to work with him again. He’d read and liked their work on Golden Gate, so he prevailed on Mr. Abbott to give Flora, The Red Menace to Kander and Ebb. All this begins to show the synergy that flows in the very small professional circles of the world of musical theatre, and it clarifies the meaning of the word “community” which is so often used by recipients of the many awards each year offered by that community for work well done. I need a minute here to follow the trajectory of Hal Prince’s career, for it moved along parallel tracks with Kander and Ebb’s. Another young aspirant, Larry Kasha, had obtained the stage rights to a film (The Shop Around the Corner) and hired Joe Masteroff, Sheldon Harnick and Jerry Bock to turn it into the musical that became She Loves Me. Kasha, like Prince, was young, talented and ambitious. He had intended to produce and direct the show, but he fell ill with hepatitis, and was able to corral Mr. Abbott to direct and Hal Prince to co-produce with him. Then Mr. Abbott demurred. Prince, most anxious to direct again, became the new director. So, while Flora, the Red Menace, which he produced, was in rehearsal, he began to plan his next project. It was to be based on Christopher Isherwood’s “Berlin Stories” and on John Van Druten’s play I Am A Camera, which was based on that source. The day after Flora opened, to weak notices, he called a meeting with Joe Masteroff, the book writer of She Loves Me and Kander and Ebb of Flora to tell them he planned to produce and direct the new musical, and he wanted all three of them to write it. Can you imagine how John and Fred must have felt? The day after their first produced collaboration was dismissed by most of the press, they now had an offer to get right up and try again. The only problem was they could see no way that this was suitable material for a musical. The Berlin stories of Isherwood had many characters and no through story line, and the play by VanDruten focused primarily on two of them; (“Sally Bowles” and Isherwood himself). There was a subplot involving a wealthy Jewish woman and her lover, but none of them seemed likely to sing. And sing about what? The Nazis in Berlin were just beginning to blight the background, and that didn’t sound promising either. At the meeting on May 12, 1965, Prince shared his vision with all of them. He introduced the Master of Ceremonies as a character, the living room set was transformed into the cabaret where the MC presided, and that was all they needed to start the score. It took until November 25, 1966, and the birth of some 55 songs from which to tell the ultimate story, but those eighteen months were exciting, terrifying, impoverishing for some, and major in terms of shaping the next 40 years for Kander and Ebb. Of course no new musical gets “from womb to tomb” without plenty of stürm und drang. Originally conceived as a three act piece, the show opened in Boston in that form. I was there. It was clearly a success. The locals were fascinated by this very different non-linear, bawdy and astringent new work. But as with virtually all musicals, birthing was a bit messy. I learned a valuable lesson that night. When the final curtain fell, I couldn’t immediately find John Kander, but I did spot Fred Ebb, and I rushed up to him full of the adrenaline that a winner always supplies. I said to Fred”: “The high spots are so there — Joel Grey’s work is star-making, Jill Haworth is authentically British, the score is dynamite, and I’m so excited and happy for you. But you know all that, so here are a few things I think need some thought. Once you turn those three acts into two and re-arrange some of the songs, you’ve got yourself a hit.” He listened, said nothing, and left me to go off to a meeting Hal Prince had requested with the production staff. I was awakened later that night by a phone call in my hotel room from a slightly hysterical Fred Ebb. “You hated it!” were his opening words.”You hated the three act format,” he went on. “That meant everything to me and now Hal wants to put the show into two acts, with just one intermission. I expect you to fight for me, not agree with him!” Prince had wisely concluded that the opening night first act curtain came down leaving the audience thinking the show was a romp with a campy MC and some funny female players in a band. Act Two suddenly introduced Nazis and anti-Semitism and other audience shockers for 1966, and it confused them. The new first act that Prince wanted would end just after the creepy transformation of the song “Tomorrow Belongs To Me” from a moving folk song sung by German youths into an angry anthem march. By re-organizing some of the music, Prince had merely wanted to more properly place the obviously hot title song, and there were a couple of other adjustments he wanted made to the score. But they were minor and clearly Ebb and Kander would be able to accomplish them by day two. But Fred always moved to the dark side, as a moth does to the flame. He was evidently undone by an incident that had happened earlier in the evening — in the men’s room! As he was informally dressed in a sweater, during the first act, a member of the audience had left his seat, spotted him at the urinal and asked if he was connected to the show. When Fred told him he was the lyricist, the unhappy customer said that he thought the show was vulgar and crude and not at all entertaining. If there was one bad notice out of fifteen, that’s the one Fred would always find and remember. How John handled that I will never know; for forty years the two remained totally committed to each other and never publicly disagreed. As John once remarked: “We go into the work room as John Kander and Fred Ebb, but we emerge as KanderandEbb.” Two disparate personalities, but each supplied something the other might have lacked, and the results proved the range that such a dichotomy can produce. Jill Haworth as Sally Bowles. Photo courtesy of Pinterest. Cabaret rolled into New York preceded by the good buzz that all had hoped for. Walter Kerr, then the head critic of the NYTimes, loved the show, though he did not love the performance of Jill Haworth. As one of the major critics in Boston had found her lacking as well, Prince had made some overtures to other actresses while he was still out of town, but in the end he decided Ms. Haworth was exactly what he wanted for “Sally Bowles.” And indeed, subsequent audiences agreed with him. Many audience members of the early New York run, knowing she’d been knocked by the very influential Mr. Kerr, gave her a hand at virtually every subsequent performance on her entrance and again as she took her final bow. Another lesson learned: Critics are entitled to an opinion of course. But it’s always subject to question and in this case Mr. Kerr was overruled. Haworth played Sally for two and a half years, and never found a role that brought her more acclaim. Success in the theatre is not subtle. One great hit, and all the principal players who created it are suddenly hot as pistols. Even their agents are treated with new respect. 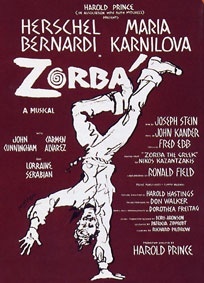 I was being congratulated and besieged with offers for Ron Field the choreographer and of course for Fred and John – in some cases just requests for meetings to discuss their future, but almost simultaneously Hal Prince actually offered the three of them the musicalization of the film Zorba The Greek, which was to be his next production. A short time later, top producer David Merrick called me (a first for me) to offer the composer/lyricist the job of creating a score for his impending musical version of Samuel Taylor’s hit play The Happy Time. There is a brief back story to all this. A year or two prior to his call, I had arranged for him to hear some sample tunes they had written as a form of audition. Herschel Bernardi (Zorba) and cast members of ‘Zorba.’ Photo courtesy of the NY Public Library. Merrick always insisted he would never give any writer or director a first shot at Broadway, but he agreed to hear them. I arranged the appointment, they played for him in his office. When it was over, the boys went home and I sat with Merrick in that office, a very red room. I asked what he thought of them. His answer was clean and clear. “They’re not up to Broadway.” he said “Very pleasant, very small time, they’ll never make it big. But this — this is a Broadway score!” and he held up pages of the music from his next show, Do Re Mi, a lesser work by the great Jule Styne, with lyrics by Comden and Green. As it turned out, there was a delay in the delivery of stage rights to Zorba The Greek. and Hal Prince had to delay production for several months, so Merrick got what he wanted, which was Kander and Ebb’s immediate followup to their great hit Cabaret. With a book by playwright Richard Nash (The Rainmaker), the writing on The Happy Time went smoothly and with Merrick’s ability to easily finance shows, the musical opened in Los Angeles in late 1967 and arrived on Broadway in January 1968. It was followed in November of that year by Zorba!. Both shows proved that no matter how impressive the auspices, there are no guarantees along the perilous roads that musicals travel before their eventual opening nights. 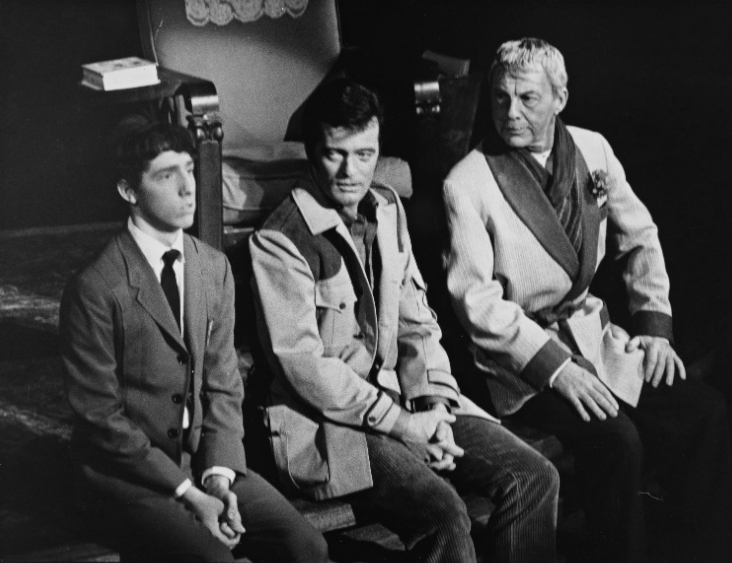 Gower Champion directed The Happy Time, and he was the “muscle”, the one whose vision came closest to being realized. Los Angeles audiences were very different from their New York counterparts. They wanted sweetness and light in their musicals and Richard Nash’s book was more realistic in presenting star Robert Goulet’s character “Jaques Bonnard,” warts and all. In the musical, he was an immature photographer who greatly influenced his young nephew in ways that disturbed the youngster’s family, and under all the charm (think Meet Me In St. Louis), a darker story unfolded. Huge photographs were electronically displayed each time Jacques opened his shutter, and they overwhelmed the small scenes playing out in front of them. Merrick and Champion batted insults back and forth but no one paid them much mind, because that had always been their modus operandi, even on the smash hit Hello, Dolly! which Merrick was always threatening to close during its protracted pre-Broadway tour. In the case of Zorba there were no major problems along the way… but there was one minor one. Prince had discovered a young Israeli cabaret singer months before he was ready for casting. He put her under contract to play “the Leader”, though he asked her to remain available for a later start date. It was a role that was not in the film but was created for the musical, much as the MC had been for Cabaret. He was convinced she would make a sensational debut in it. But she wasn’t accustomed to the discipline of the stage, and after the Friday first preview of the show in New Haven, before the Saturday matinée and the opening Saturday night, she went into New York to attend the wedding of a friend on Saturday morning, expecting to be back in New Haven for the matinée that afternoon. But she didn’t make it, arriving at the Shubert Theatre at the end of the first act. Her understudy, Lorraine Serabian, was on, and she scored in the role even though she’d learned it on her own and had never had a rehearsal. Prince was so angered by the cabaret singer’s attitude and lack of devotion to the project, that he allowed Serabian to open that night. She played it through the entire run; the other lady was paid off and sent packing. The show was not the success that Cabaret had been, but it won a Tony for Ron Field, and along with The Happy Time, it established Kander and Ebb as a theatre team that was here to stay. It played some 10 months on Broadway, and it had a tour. The reviews in New York were mostly favorable, and it got off to a good start at the Imperial Theatre. But as the run continued, business began to taper off, and after exploring all the possible reasons for that, it was concluded that Herschel Bernardi and Maria Karnilova, the stars playing Zorba and Mme. Hortense, seemed overly familiar to general audiences, for they had both become so identified with the two leading roles in Fiddler on the Roof, which they had played for long runs, that somehow there was a feeling of “been there, seen that” about them, even though they were quite as marvelous in Crete as they had been in Anatevka, Russia. By the time Zorba closed it was by Variety’s definition, a hit. That meant it had earned back its cost, and turned a small profit. So our guys had had two successes in a row with Hal Prince as their director/producer and with Ron Field as their choreographer. As the theatre is not where logic prevails, they would never work with Field again, and it was 23 years before they did another show with Hal Prince. Their two musicals from the season of 1967-68 had similar Broadway runs of 286 (The Happy Time) and 305 performances (Zorba!). The original Zorba the Greek film’s stars Anthony Quinn and Lila Kedrova had more success in 1983 with the musical on a tour and over 300 performances of it on Broadway. After five Broadway productions in 4 years, John and Fred were settling in to comfortable lives. Their income from Cabaret alone had made it possible for Fred to move from a small apartment on West 72nd Street in New York to a much more commodious one on Central Park West. John moved from Greenwich Village (307 West 4th Street, which was used in a lyric as the home address of Flora, the Red Menace) to a commodious brownstone on the Upper West Side. Neither ever moved again, though they both ultimately added second homes in “the country.” Fred’s was one that had belonged to film star Rhonda Fleming in Bel Air, California. “I visit it, just to remind me how much I love New York,” was his reasoning. John found a comfortable home and studio in upstate New York and he still loves to write there when he’s on to a new project. Because John loved to travel, and Fred thought “travel” meant a trip to Brooklyn, they decided to spend their summers apart. This gave me the very pleasant opportunity to spend part of those summers visiting London, Rome, Vienna, Interlachen, Amsterdam with John, and the occasional winter week with him in St. Kitts, Dominica, Martinique, and St. Martin. John Kander leaning out the window of a train on descent from Jungfraujoch in Switzerland. Blissfully relaxed. Photo by Richard Seff. I remember a winter flight to San Juan where we had to wait at the airport for a connection to one of the smaller West Indies islands. We had a drink in a not very imposing tiny bar where a tacky 3-piece combo was trying to entertain above the din. At one point, out poured the opening chords of the title song from Cabaret. It was the first time either of us had ever heard a piece of his played in public and I jumped up and shouted: “That’s your song! If I tell them you’re here, that the composer is right in front of them, they will go crazy!” He pulled me down, shut me up, and said with a grin, “If you ever do that, I will pretend you are some crazed stranger I’ve never seen before.” I’m sure he got even a bigger kick out of it than I did, for it was a first for him too, but that was John. The spotlight never was and still is not his favorite place to be. Fred might have joined them on the tiny stage. He loved to perform; John does not. ‘Come Hear The Music Play’-A Behind-The-Scenes Look at Kander and Ebb’s Musicals by Their Former Agent Richard Seff Begins Tomorrow on DCMetroTheaterArts by Richard Seff. ‘COME HEAR THE MUSIC PLAY:’ Memories of My Twenty Years as Agent For John Kander by Richard Seff: Part One: The House Lights Dim’ By Richard Seff. Richard Seff’s memoirs: Supporting Player: My Life Upon the Wicked Stage.